I’ve been writing a bit about the origins of Homo sapiens, for example here and here, but I’ve said virtually nothing about Australopithecus sediba, a species, sub-species or whatever which has been much in the anthropological news of late. Having read up a little on the matter, I don’t know quite where to start. Well, I’ll start with Steven Novella’s treatment of the recent findings on SGU. He makes the point that we have so little to go on as yet that we can’t be sure, but the evidence so far presented suggests that we may have found the species from the Australopithecus genus that connects it to the Homo genus. The finds were made in 2008 and have been written up recently. As Novella points out, what we’re looking for is the first evidence, in otherwise ‘primitive’ specimens such as australopithecines, of features, or some kind of feature at least, that’s typical of more modern forms, forms in the Homo line. It’s very shaky stuff because of the paucity of material from which to make generalisations, but there seems to be some tentative evidence that these specimens, possibly a mother and son, are the most human-like australopithecines yet discovered. They’ve been dated quite precisely now, to a little under 2 million years of age. 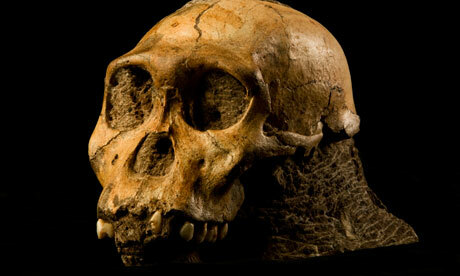 Homo erectus is currently dated as existing between 1.8 and 1.3 mya. The African Homo ergaster – which has in recent years become more accepted as a distinct species, is believed to have evolved from the earlier Homo habilis around 1.9 to 1.8 mya, or to have diverged from it, with the two sharing a common ancestor. The most recent fossil attributed to H ergaster is about 1.4 million years old, and the evidence indicates that H habilis and H ergaster co-existed for a few hundred thousand years. The matter is quite complicated, made more so by recent finds. Up until last year H habilis was the earliest known species of Homo, but analysis of some fossil remains found back in the seventies, using various recently developed techniques, have uncovered [not incontestably I’m sure] a new, more ancient species, H gautengensis. Interestingly, those making claims for H gautengensis argue that because it is older than the Australopithecus sediba specimens found, and because it appears to be larger brained and more ‘advanced’ generally than A sediba, this casts severe doubt on claims for A sediba being the transitional species. They suggest that A garhi, a gracile australopithecine, fossils of which date back to 2.5 mya, is a more likely candidate. Researchers used a powerful x-ray scanner at the European Synchrotron Facility in Grenoble, France, to create exquisitely detailed maps of the interior of the skull of one of the individuals. The bumps and other contours revealed the imprint of a small brain, only 420 cubic centimetres in volume, but one that was apparently reorganising from a primitive structure into a more modern form. Kristian Carlson, a colleague of Berger’s who worked on the brain scans, said some areas of the organ appeared more developed than expected. “There are areas above and behind the eyes that are expanded and they are responsible for multitasking, reasoning and long-term planning. These are changes that mirror the differences that humans exhibit from chimpanzees,” Carlson said. The discovery challenges the previously held theory that our ancient ancestors grew large brains before they reorganised to resemble the modern human brain. A great example of how more detailed research often raises more questions than answers, and takes us deeper into the mysteries of evolutionary adaptation and development.